SIMMER fish in water seasoned with salt and liquid crab boil 5 to 7 minutes or until cooked. Remove fish, cool and flake. IN A LARGE SKILLET melt butter over medium-high heat. Add bell pepper, celery, onions and garlic. Cook until vegetables are tender, about 3 minutes. STIR IN flour and cook for 2 minutes, stirring constantly. Stir in cream, parsley and Cajun seasoning. Simmer about 10 minutes until slightly thickened. ADD cheese, stirring until melted. Remove from heat. Add flaked fish to cheese mixture. 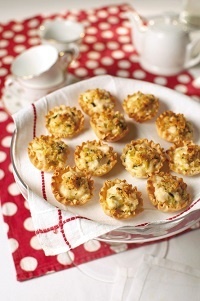 PLACE phyllo cups on baking sheets. Fill cups evenly with mixture. Sprinkle topping over pastries. BAKE until lightly browned, approximately 15 minutes. Serve warm.